Transparent Cosmetic Makeup Organizer for Lipstick, Brushes, Bottles, and more. Clear Case Display Rack Holder. 1.Perfect to display lipsticks and other items of make up,Avoid the hassle of make up bags. 2.Crystal-clear design matches any decor and provides a fashion forward trend for your daily morning beauty routine.That can hold lipsticks, brushes, concealers, nail polishes and lip gloss. 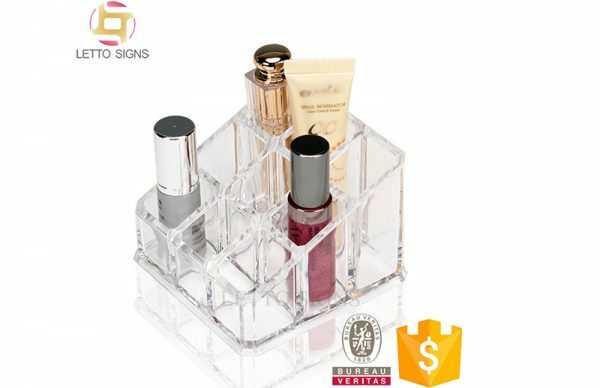 3.Ideal makeup organizer gift for any occasion such as birthdays, Christmas, Mother’s Day, and Valentine’s Day. 4.Makes the ideal chic makeup box display case for storing, organizing, and displaying cosmetics in your home, beauty salon, or store. A perfect showroom display risers for all your product layouts and makeup brush sets. 5.Trasparant material that is durable with a glass-like smooth quality. With 9 square compartments that can be used for eyelash brushes, lipstick organizer, contour brushes and other lattice cosmetics. Easy and simple way to keep organized!